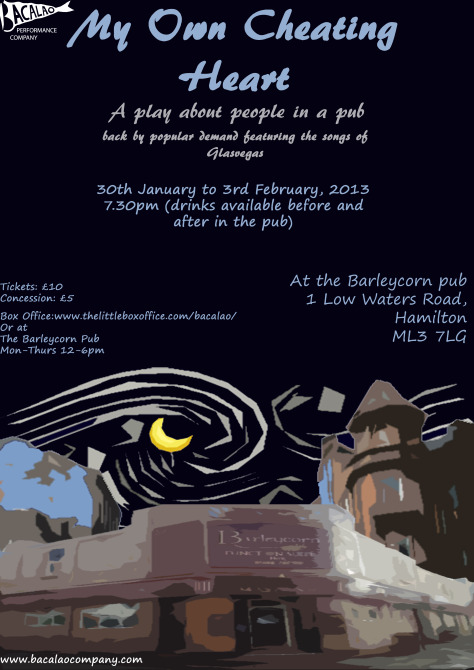 A play about people in a pub. After its success in spring 2012, My Own Cheating Heart is now back due to popular demand. The play is inspired by and featuring songs by Glasvegas. A musical, funny, charming, warm and genuine piece of theatre, about life's disappointments and our efforts to make the best of it. Everyone involved can be incredibly proud of what they have achived and will achieve with this production. We thank them all for their hard work, creativity and bravery. We hope we can mimic this in what we do in the future. They have been a true inspiration."